marks-3zet introduces new compact "One® Autoloader"
Fully automated imaging of waterless and conventional thermal plates. 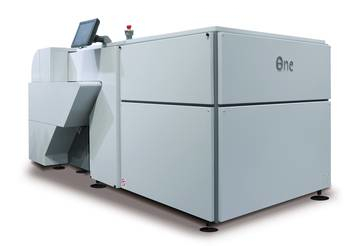 One® Autoloader, our new top?quality and fully automated plate loading system, supports a wide range of printing plate formats (240 x 300 mm to 850 x 1,075 mm). Along with a processing machine, a transport bridge and a plate stacking unit, One® Autoloader provides the operator with a reliable system for the automated production of printing plates. The compact and highly accessible system in a modern Italian design contributes directly to an increase in productivity: The automated plate loading ensures a continuous production flow, resulting in a more efficient and cost?saving production process. The system guarantees a safe and automated removal of interleaving paper. The new plate loader provides maximum operator convenience. To facilitate the plate changing process, One® Autoloader by default is equipped with two plate trolleys and two plate cassettes, each of which can be loaded with up to 130 plates. You are welcome to inspect and test the new One® Autoloader at our Democenter in Muelheim an der Ruhr, Germany, at any time.